Nashville, TN -- Don Williams' legions of fans across the globe have long been hoping, but likely not expecting to hear new recordings from him again. He has been pretty determined to spend most of his time on his Tennessee farm, quietly, with his family -- and for over four decades, country music's "Gentle Giant" has been known for doing what he wants to do. So it's both exciting and a very welcome surprise to announce the release of the brand new Don Williams album And So It Goes, on Sugar Hill Records on June 19th, his first since 2004. It is a release very much in the classic Williams mode--mellow yet rhythmic, life-affirming yet thoughtful, serenely masculine, and loaded with singularly strong, memorable songs and consummate vocals. Those are the attributes that won him over fifty top hits from the early 1970s through the early 1990s, including such standards-to-be as "Tulsa Time," "I Believe in You," "It Must Be Love" and "Good Ole Boys Like Me," and won him the ultimate accolade with his induction in the Country Music Hall of Fame in 2010. With the chance to reunite with honored Nashville producer Garth Fundis, with whom he'd worked for seventeen years on many of his greatest successes and encouragement from his management and the label, he decided to go back to the studio one more time, as well as out on tour to support the release. As Don puts it himself, "I didn't do this album because I just felt that I was going to die if I didn't do another one, but because of all of that encouragement to do it. So here we are--and now I'm feeling good about it." 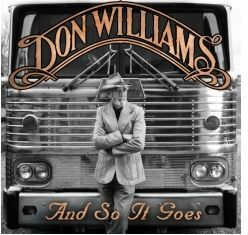 Laidback country icon Don Williams' And So It Goes, his first CD in eight years, is out on Sugar Hill records June 19th. Keith Urban, Alison Krauss and Vince Gill join him as singers and instrumentalists. The recording emerges as a sonic whole, with Don's long intact working band at the core of the musicians behind him ("a beautiful thing," Don calls that), including celebrated guitarist Billy Sanford and percussionist Kenny Malone,. Such long-time Don Williams admirers as Keith Urban, Alison Krauss and Vince Gill add both key instrumentals and vocal backing. "We weren't looking to reinvent Don," producer Garth Fundis notes, "just to make a good new Don Williams record." In that they have succeeded in spades, the instant return to form pleasantly surprising Don himself: "When we started back up again," he says, "it was like we'd never quit." The CD proceeds from the upbeat, earworm-catchy opener "Better Than Today" through contemplative considerations of grace and calm ("Heart of Hearts"), the charms of an actual, credible woman ("She's a Natural"), and even the possible existence of aliens ("Infinity") and on to the closing title track about love, loss and the passing of time. The duet with Ms. Krauss, "I Just Come Here for the Music," sounds like a country standard in the making. When word went out that Don Williams was going to record again, literally hundreds of potential songs from Nashville's finest were offered, and ten selected from such outstanding masters of the songmaking craft as Kieran Kane, Ronnie Bowman, Al Anderson and Leslie Satcher, Don's son Tim Williams, as well as Don himself. "The only description that I've ever had for songs I choose to do," he notes, "is that they affect me emotionally and that, hopefully, they have something to say that will touch other people." In doing both of those, listeners are about to find, And So It Goes doesn't miss a beat.